On February 8, 2015, the Egyptian regime announced that instead of freeing Mohamed Fahmy, award-winning Canadian journalist, from over 400 days of wrongful imprisonment, they would begin a retrial on Feb 12. Even after he renounced his Egyptian citizenship as a condition imposed on him for freedom. On February 9, 2015, Farahway Global joined Mohamed Fahmy’s family, and the Free Tarek and John campaign team in launching #HarperCallEgypt. On February 11, 2015, our founder, Farah Mawani, released an open letter to Prime Minister Harper regarding Mohamed Fahmy. On February 16, 2015, she joined 249 other notable Canadians in a joint open letter to Prime Minister Harper. 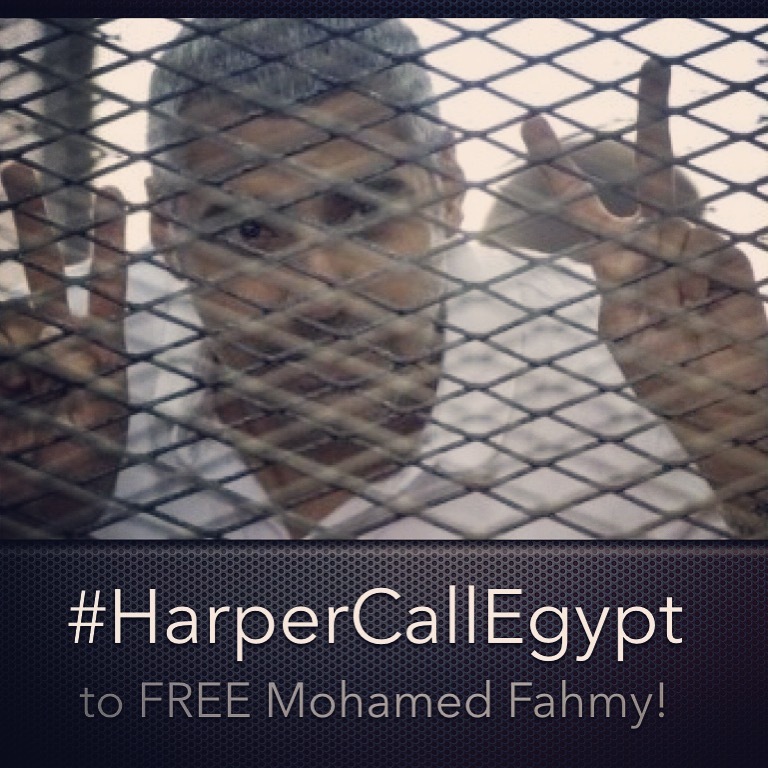 In one week, we achieved great strides towards our goal of Prime Minister Harper calling President Sisi to ensure that Mr. Fahmy’s deportation order be honoured so he can return safely home to Canada right away. On the eve of Mohamed Fahmy’s retrial, the Prime Minister has not yet made that call. During this week leading up to his retrial in Egypt, join our week of action to free Mohamed Fahmy. After 415+ days without freedom for Canadian journalist Mohamed Fahmy, and one week of intensive campaigning for Prime Minister Harper to call President Sisi, PM Harper has not taken direct action to secure Fahmy’s full freedom. Even when asked directly in Question Period yesterday, by NDP MP Wayne Marston, and Liberal MP Marc Garneau, whether PM Harper has called Sisi directly, the Parliamentary Secretary (Foreign Affairs) did not give a direct answer. At this critical time for Mohamed Fahmy, we want to know why he refuses to intervene personally and immediately to ensure Mohamed Fahmy’s safe return home to Canada. We ask you to join us in urging him to do so. Let’s call Harper until Harper calls Egypt. 1. CALL Prime Minister Harper at 613.992.4211 every day this week. 2. 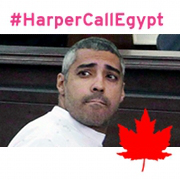 ASK your friends to join the call for Harper to call Egypt. Email this call to action to your friends, contacts and list-servs. Post this call to action on your Facebook, Twitter, and other social media accounts (share the call from our Facebook event page, and Twitter #HarperCallEgypt hashtag). Ask organizations you belong to or know to encourage their membership to participate. After 411 days of incarceration in Egypt, and a few days out on bail, Mohamed Fahmy has been unsuccessful in his attempts to return home to Canada. His legal counsel, Amal Clooney, has stated that there is no legal impediment to Fahmy’s immediate transfer to Canada.Currently released on bail and facing a retrial starting February 23, Fahmy and his family are concerned that the Canadian government has not advocated on his behalf at the highest levels of the Egyptian government. This despite thousands of Canadians, international human rights organizations and global political leaders urging Prime Minister Harper to contact President el-Sisi and request that Mr. Fahmy’s deportation order be honoured.